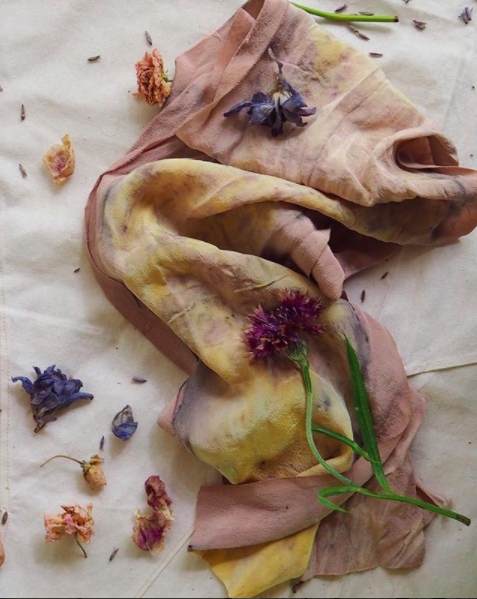 This ecourse starts your magical journey into the world of natural dyes - using plants, flowers, leaves, kitchen scraps and more to extract colour, for dyeing fabric & yarn. You'll learn through videos and downloadable info sheets for to make colours, how to mordant and care for your fabrics, and how to use many different dye processes. I share my love of botanical dye, opening your eyes to the magic & art, while also sharing the science that underpins the process. The videos are like an in-person workshop, that you can watch from your own home. You have lifetime access to all the content, as well as any extra additions, as I film them. I've had many people attend my workshops and watch my videos, who go on to begin their own creative business making & selling botanically dyed fabrics or yarn. I share what I know in an open manner, giving you the ability to go out and explore your own garden. This is just the beginning of a beautiful journey; you will never look at a flower or leaf in the same way again! This pairs beautifully with my FREE slow stitch online workshop, as well as my loom weaving, lampshade making and my upcoming fabric jewellery making online workshops. Imagine weaving, creating & making with your own colours!